Stress is a part of life-but it doesn’t have to take over your life. With this guide, you’ll develop the skills needed to help you manage difficult emotions, cultivate self-compassion, adopt positive physical and emotional habits, build resilience, and connect with your true values. Everyone experiences stress. From the moment we wake up in the morning to the moment we finally settle into bed at night, our days are packed with stressful moments-some big and some small-that can quickly add up and feel overwhelming. Unfortunately, you can’t escape stress. But you can change the way you relate to it. This important workbook will show you how. 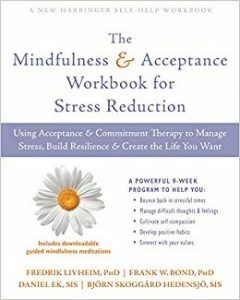 Written by internationally renowned ACT experts, The Mindfulness and Acceptance Workbook for Stress Reduction offers a powerful ten-week program for stress management drawing on the latest research in acceptance and commitment therapy (ACT) and mindfulness. You’ll gain a better understanding of what stress really is, how it affects the brain and body, and what you can do to manage and reduce stress in your life. You’ll discover how to build resilience and set smart, effective personal goals that align with your values. And finally, you’ll learn to be more aware of how you deal with stress in the moment. Stress is an unavoidable side effect of being human in today’s fast-paced world. But with this workbook, you’ll build the skills necessary to keep stress in its place and live a more vital life!